Can I protect my seats from damage? | What Car? Can I protect my seats from damage? Im trying to find a way of protecting my car seats from wear and lasting-indentations left by my childs car seat. Would it be safe to put a layer of carpet underneath the seat? Putting a layer of carpet under the car seat is potentially dangerous. If its too thick, it could raise the seat too high. Or, if its slippery it could allow the seat to move around. 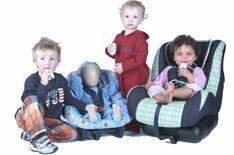 There are specially-designed products to do just what you need, however, such as the Sunshine Kids In Car Grip-It Mat (9.99 from Amazon.co.uk) and the Neatseat (24.99 from Mothercare). Both are safer ways of keeping you child seats in place, without them damaging your car seat at the same time. New Tesla Model 3 vs Model S: which electric car is best? New Hyundai Ioniq vs used BMW 3 Series: which is best?